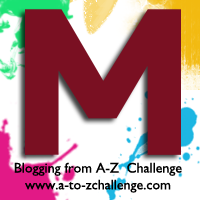 For the letter ‘M’ I have chosen the colours Maroon. Maroon is a rich, deep reddish purple colour. It’s named after the French word ‘marron’, meaning chestnut. This Pinterest board features lots of maroon fashion ideas. Maroon symbolises luxury and wealth. It can also represent spirituality-it’s the colour of the robes worn by Vajrayana Buddhist monks like the Dalai Lama, for example. It can also be associated with smartness and formality-the distinctive maroon beret is used by airborne military all over the world and maroon is a common school uniform colour. Did you hear about the red ship and the blue ship that collided? All the sailors were marooned! Lastly, I’m going to share some music from Maroon 5, which was one of my favourite bands growing up. They’ve made a bit of a comeback lately and their new stuff is okay, but I’m still nostalgic about their old tracks, which were part of the soundtrack to my teens!